BECOME A CRUSADER TODAY AND HELP ME, BATMAN (AKA AEDAN HARRIS) ON MY CRUSADE FOR AN INDEPENDENT, HEALTHY LIFE. My name is Aedan, and I like to think I am Batman. Right from birth I have had a few extra barriers in life, but I'm getting there and for the last 9 years I've been constantly proving doctors wrong. I have Cerebral Palsy, Visually impaired, Autism, Epilepsy and I am classified as a quadriplegic. But none of this defines who I am or who I want to be. 2017 has seen my family complete all household modifications to our home, we have achieved our dream of a completely Aedan friendly and accessible home. Our next goal as we move to 2018, is to continue my physical development and due to constant growth, replace my running chair. Follow our family shenanigans of family fun, lots of running and love of life. CP really has not limits!!! You can join in the fun, and receive lots of big smiles. Contact mum and dad at aedan_harris@hotmail.com to find out how. Here's a little story, about a little battler. His name is Aedan, he is 9 years old and he cannot stand without assistance, and he cannot walk without aids. But just because he can't now doesn't mean he won't. We are working hard to help make that happen for his overall health & physical wellness. Aedan has cerebral palsy, he has low vision and he has an intellectual impairment. He spent most of his life in and out of hospital. Aedan also has a huge personality, a love for life, but it can be a little bit cheeky. Spend a little time with him and he will make you fall in love with him. He has a sister who is only 8 months older than him, who he loves more than anyone else. And like all brothers, he enjoys nothing more than getting into mischief with her. Aedan's Crusade was started to help us fund the gaps in Aedan's therapy & equipment needs. We fundraise to give him every opportunity that he deserves. This is why we wear our hearts on our sleeve, and have become the crazy family in blue. My goal is to be independent, keep moving and getting the most of live. I love to swim, play the violin and go horse riding. Regular hydrotherapy and horse riding helps keep my hips in alignment and reduces the risk of hip displacement, something I have already had surgical intervention for. We've managed to avoid surgery for 2 years and now I need to keep moving so as not to waste that opportunity. My favourite activity is running with my dad. He has pushed me in two marathons and our dream is to keep running and even try our hand at triathlons. The fresh air makes me smile and my smile is contagious with everyone we meet. I love being ut in the thick of things encouraging and inspiring others to have a go. 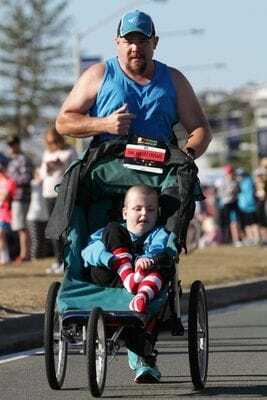 Your donations will allow Aedans dream of walking and competing in future marathons a reality. Every donation of $2 or more is tax deductible. Please share our story, follow us on Facebook and fall in love with an amazing little boy. Please share this fundraising page with friends and family. Merry Xmas from Terry & Elaine, Sharon, Michelle & Dean, Jim & Carol,Leanne & David, Linda & Allen,John & Carolyn and families. In memory of one your greatest supporters. Our love and thoughts are with you all, the Hogan family. Merry Xmas from Terry & Elaine, Sharon & Noel, Michelle & Dean, Jim & Carol, Micheal & Julie, Leanne & David, Linda & Allen, Kate, Wayne, John & Carolyn and families. Hi Cam, hopefully everything is going well on your end! So proud of how far you've come yourself and as a family. Good luck for the future, keep it up!